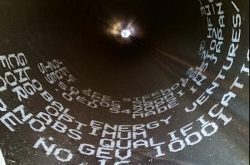 Global Energy Ventures Ltd (GEV), an Australian developer of global integrated compressed natural gas (CNG) projects, reports the Long-term Fatigue Test and 6,000 cycles Notched Burst Test for its high-strength line-pipe by ABS have been successfully completed. Only the Cooled Burst Test remains to gain full CNG Optimum cargo system approval. The abovementioned tests mark the significant positive progress made to close out the three Cycle Fatigue Tests which are the final tests required before obtaining American Bureau of Shipping (ABS) full class design approval. Long-Term Fatigue Test: This long-term fatigue test required cycling a representative pressure vessel for ten times the design life of the cargo system from minimum pressure to the operating pressure. This is an extremely rigorous test that CNG Optimum has passed and is greater than the required design fatigue life of the ship itself (typically 25 years). GEV says this means that the CNG Optimum cargo system approval will be for 35 years of operation, based on one cycle (round trip) every week and on ABS’s factor of safety requirement of 10. Cooled Burst Test after Fatigue: This test requires fatiguing the specimen through 3 times the design life (6,000 cycles) and then bursting the pipe after it has been cooled to simulate the temperatures that would result from the Joule-Thompson cooling effect of gas escaping through a crack. The specimen has been made and this test will commence later next week and will take about 14 days to complete. 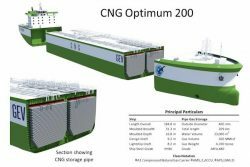 As stated in GEV’s 2018 AGM presentation, CNG Optimum is a ‘fit for purpose’ solution, with ships and fleets sized to fit the initial market. CNG Optimum ships are equipped with dual-fuel engines which run on natural gas from their own cargo. As a result these ships will be among the cleanest running in the world. Reducing emissions from the shipping industry is a key focus of the International Maritime Organisation, who as of January 1 2020 will be enforcing strict regulations on marine fuels.